There have been happenings in the car/bus space, but in the interest of space and a single focused post, today's post will just focus on going to the movies last Thursday. 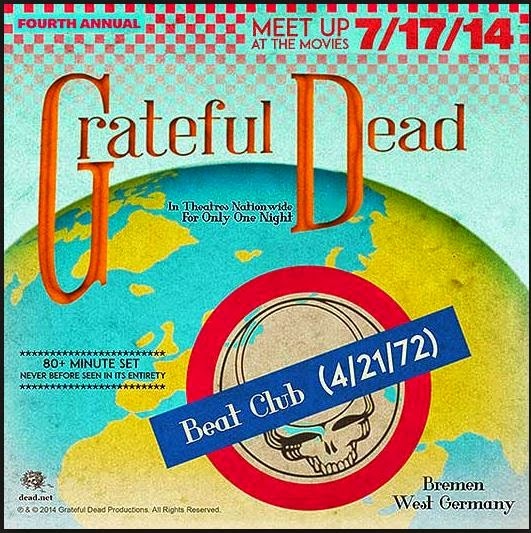 Thursday, July 17th was the annual Dead-head night at the movies. In previous years, these events have aired full-length concerts. For example, last year (or the year before that) we saw the Sunshine Dairy benefit concert from Veneeta OR from 1972 called "Sunshine Daydream". Having been too young to have been there at the time, it was great to see what the scene was like and watch them play a great show. This year, the producers found the raw footage from the Europe '72 tour when they played in a tv studio for about 80 minutes. A portion was later aired on UK's Beat Club tv show. As a movie, it wasn't that great, but as a music fan it was really interesting to watch them as if they were working in a studio. For example, they stopped "Sugaree" after the first verse because Phil missed a change and played "Playin' in the Band" a second time because Donna howled too loudly on the first take. In both cases, the second run was better, so it was the right call. I base my theory on the second "Playin" on a background conversation you can see between Jerry and Donna about standing further away from the mic. Seeing Pigpen in such a diminished role was curious too. Considering his health at the time, I wondered how he contributed in his last year while his "replacement" (Keith) took over and established himself. Keith was almost inaudible through most of the film, only really peeking out sparingly on the later songs. The sound was very good and well balanced. The film started with them checking the mic's and having side conversations. Then, without much prompting, Bob shouts out a band introduction and they're off. Like a show, it didn't seem as though they had a plan for what they were going to play. In fact, they called Donna out to the 'stage' to sing on "Playin' in the Band" with a vague "how bout you come on up and sing on this" kind of vibe. At the very end of the film, the band is playing a holding pattern coming out of a "the Other One" while Bob replaces a broken string. Just as he gets it tuned in and the band starts to turn into a jam that's moving into a clear direction, the film suddenly ends. Like a brutal cut in an old bootleg, the credits roll and you're left with that wondering of what came next. 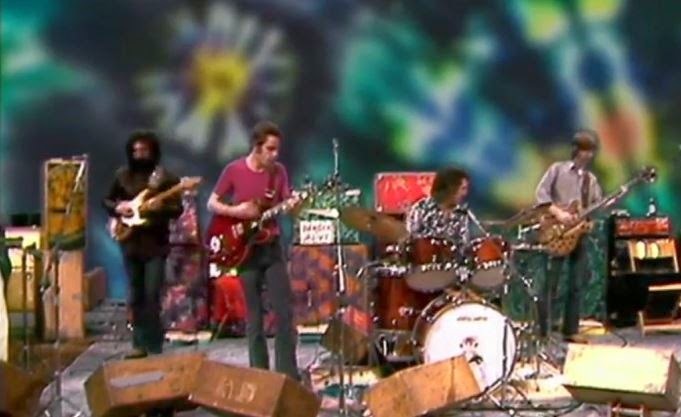 Staged in front of a green-screen showing tie-dyed sheets, the band was set up much like they would for a live performance (see picture). Based on the staging, though, it seemed like they didn't know what to do with Donna. When she was singing, she stood in front of Jerry, using his mic but forcing him back to his Wah pedal but out of direct line-of-sight with Bob and Phil. When she wasn't singing, she stood in front of Pigpen's organ, blocking him from the cameras. Still, considering it was 1972 and capturing live music on camera was still in its Woodstock-ish early years, it captured the band well. Kieth didn't get much camera time, but Billy and Phil did, even though they didn't sing much (or at all in Billy's case). Jerry and Bob were, of course, the focal point of most of the camera work, but that makes sense considering their lead vocals and guitar work. It didn't appear that the band knew the cameras were rolling the entire time. Prior to a few song starts, you could hear one or more of the members say "we're rolling" before they started counting into the song. Unlike previous years, Boo and I piled all of the boys into the bus (Hapy drove great again) and shared Dead-head movie night with them. Unexpectedly, they all took something positive from it. T, for example, gained an appreciation for how Garcia approached and played the instrument. He's heard their music before (obviously), but hadn't gained that understanding until he saw him play. Interesting. C appreciated what Billy could do on such a simple kit. I was disappointed in the size of the crowd. It was much smaller than the "Sunshine Daydream" year, but maybe there was a different local showing deeper into Portland which attracted some of that crowd. If not, I'm afraid the numbers may not warrant airing something next year. That would be a shame. With all of the simulcast concerts from the 80's and 90's, there are many years worth of material left. That's it for today. I'll try to get another post in before the weekend. Thanks for following along! !